Together, we bounded across the surprisingly tiny kingdom of Hyrule. She and I were the best of friends, in fact, she was my closest friend. When I was a child, I played a melody to her, and we connected in a way that transcended time. As an adult, she was my constant companion. I hated going underground into the depths and darkness, as I had to leave my friend behind. Fortunately, wherever in the world I went, I just had to play that simple melody from our mutual past and she would be there by my side. In another world, her name 'Epona', was the goddess of horses - such a powerful symbol of fertility and equine power to the Gauls that the Roman empire adopted her as part of their pantheon. She was the first of my equine friends, and still one of the greatest. I cannot wait to see her again. In my short life as Barbie, I struggled privately with my anorexia nervosa; but I had many friends to keep me company, and together we rode through beautiful landscapes. Even if I couldn't eat, I could at least give sugar lumps and apples to my many animal friends. My stables were full of horses, although sadly this reduced my connection with any individual horse - not to mention the macabre genetic manipulations that went on to allow me to change the appearance of each horse. But all of this pales into insignificance next to the joy of riding at full canter through green fields, surrounded by butterflies and blossom, and the simple satisfaction of lining up a jump perfectly, or ducking to avoid a low tree stump. A shame that dark unseen forces dictated the need to add more 'challenge' to this game (the game developer is blameless in this), as its riding experience was quite exquisite. And what of that incomparable destrier, Red Hare? A fire-red mare, so perfectly attuned to its rider's wishers that it would stop dead upon seeing a hare, allowing the hunter upon its back to take a perfect shot with a bow. It once belonged to the most powerful warrior of its era - the mighty Lu Bu - but despite his power he could not be trusted, and this ultimately lead to his demise. Consequently, the horse entered into the stables of the powerful warlord Cao Cao, the dominant power in the Three Kingdoms at the time. 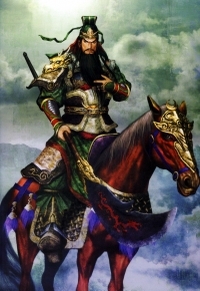 It finally came into the possession of the legendary Guan Yu (pictured) during the time he served in Cao Cao's forces while seeking his missing oath brothers, the dutiful Liu Bei and hot-headed pig butcher Zhang Fei. When I ride Red Hare, this incomparable war horse, no one can match our speed, and the enemy forces scatter and tumble as we gallop towards our next opponent, the taste of battle burning our lungs. Finally, we come to willful Agro. He too is my friend, for he seems to know better than I that the path upon which I travel can lead only to destruction and doom. He resists my commands, pulling at the reins and champing at the bit. Whereas other horses have obeyed me without question, Agro would like nothing more than for me to give up my insane quest and instead just ride out over the land, feeling the wind in my hair and in his mane... But this can never be. Despite his obstinance, he is also faithful and proficient. When a narrow gorge must be crossed by a stone path few horses would have the constitution to attempt to traverse, Agro sets a gentle pace and trots across confidently. Yet this is no mere riding horse, for he holds perfectly still when I take bow in hand, and a simple whistle calls him to my aid. Loyal yet rebellious in his determination to persuade me to abandon the course of self-destruction, perhaps he is the truest friend of all. As a child I was traumatised while watching The Neverending Story to see Atreyu's horse Artax, overcome by despair, sink to his death beneath the mud of the Swamps of Sadness. Very dramatic stuff, when you're eight. That horse only had about three minutes of screen time, total, and yet it won my heart. Shadow of the Colossus is the only game ever that's made me start to feel an in-game horse is anything more than a boost to my speed attribute; I'm having trouble actually picking up the controller, because whenever I look at that horse I can see the Swamps of Sadness in its future. Tragedy, thy name is a well rendered horse. 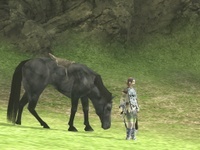 I won't get started on SotC again, but it's tough to go back to lifeless in-game horses once you've enjoyed riding Agro. When asked about adding in certain features, like the horseriding tricks that don't necessarily have any purpose in the game, Ueda said that it stemmed mostly from desire--wouldn't everyone love to be able to ride a horse like that? "I just love being able to pat his neck and say something nice to him." Can you please enlighten me to the controls that allow this? I have sought often, and not found. This was basic functionality in Barbie Horse Adventures that I used constantly, and I feel its absence soundly with Agro.